When I was growing up in Port Elizabeth in the 1970s and 1980s, although it was a wonderful place to live, let’s just say it was not exactly a culinary hotspot. Hot restaurants du jour included the Hungry I (steaks and seafood), El Cid (steaks and seafood), The Coachman (more steaks and seafood), and La Fontaine (a 70’s extravaganza of a menu including grapefruit cocktail, smoked salmon with Melba toast, Wiener schnitzel and, of course, steak with a green peppercorn sauce). Ethnic food was not huge and mostly reflected the demographic – and because we had a large Chinese population, we did at least have Chinese restaurants. But when I moved to London I discovered that much of what I knew as Chinese was a bastardised version – my beloved Shanghai steak in particular (fried strips of beef steak in a soy sauce gravy with, ummm, green peas) is evidently unique to South Africa. So imagine my delight when I arrived in London to discover the many and varied pleasures of crispy duck! Yet it was not the ubiquitous crispy duck, but the famous and subtly different Beijing duck that was the raison d’etre for a recent visit to Min Jiang, sister restaurant to the Singapore originals, perched in a sleek modern space on the tenth floor of the Royal Garden hotel in Kensington. If you are here for the view (and it is admittedly spectacular) then a daytime visit is recommended as the huge windows look out over the beautiful Kensington Palace Gardens. Sadly, we visited at night, but even then there is great fun to be had picking out London’s lit-up landmarks. Don’t let the view distract you too much though – the star of the show here is definitely the food, in particular the signature dish of wood-fired Beijing duck (which you are well advised to pre-order at the time of booking your table, seeing as it takes 45 minutes to prepare). Upon arrival, we were first ushered into the chic bar area, minimalistically decorated with large Chinese vases, where we were talked through the menu and promised some pointers on Chinese dining etiquette. The first order of business, though, was the cocktail menu – a list divided into Champagne, classic, martini, Min Jiang signature, and non-alcoholic cocktails. I chose an Oriental Moijito (£8.75) consisting of lime, watermelon, sugar and mint muddled together with rum – a fresh and fruity take on the classic moijito. There is also a good selection of wines by the glass available as well as an extensive spirits selection. While in the bar we also tried a couple of appetisers including the steamed dim sum platter (£14.50) consisting of 8 steamed dumplings. These included jade bamboo; steamed crab meat; pumpkin; and scallop, prawn and water chestnut dumplings, all of which had feather-light wrappers and generous fillings – the prawn & shrimp was a particular favourite of mine. 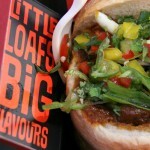 (I am now dying to go back and try their char siew buns!). The other starter that we tried was the Bi Feng Tang Soft Shell Crab with Garlic and Chili (£12.90) – my first introduction to this dish of crabs that are deep-fried and eaten whole, shell and all. And what a glorious introduction: crispy, succulent, not at all oily, and coated with plenty of crispy fried garlic and chilli on top. Dangerously addictive. And then came… The Main Event: the Beijing duck (£58 for a whole duck). Before we tucked in, we were given a bit of background info on the Beijing duck and why it is so special. Most of us will have eaten (and loved!) crispy duck pancakes. This is a similar dish, but all you need to make it is a duck and a deep-fryer. Beijing duck is a little more subtle and complex, and starts with an excellent quality duck weighing between 2.3kg and 2.5kg, between 45 and 48 days old. At Min Jiang, all their ducks are sourced from Silver Hill farm, in Monaghan, Ireland and are bred especially for this particular dish. Min Jiang employs three specialist duck chefs who wash and baste each duck in a special aromatic sweet basting sauce, then allow it to air dry for a few hours and finally slow-roast it in a wood burning oven to maximise the flavour. The result is a bird with incredibly moist and tender meat, but a burnished and aromatic skin, which is then carved at your table by one of the chefs. First, we were presented with slivers of the bronze skin, together with a little heap of granulated sugar into which the skin is dipped before eating. I’m not sure that I would repeat the sugary dip, but the skin itself is deliciously aromatic and decadently fatty. Once the chef had carved enough slivers off the duck breast to serve the table, the pancakes are brought out – and I have to say that these are marvels of culinary engineering: translucently thin yet strong enough to hold their filling together. At Min Jiang, all their pancakes are made in-house and each pancake takes 10 minutes to make, we were told. We were also given an impromptu lesson in how to fold a pancake using only a pair of chopsticks and a fork, something which we all attempted but soon discovered was not nearly as easy as staff had made it look! We were offered both the traditional accompaniments to the duck pancakes (hoisin sauce, shredded spring onion and cucumber batons); or a more unusual combination of garlic paste, daikon radish and pickled tientsin cabbage. Although I did love the latter selection of flavours, for me there can be few better things than duck, hoisin, spring onions and cucumber. Once we had eaten our fill of the duck pancakes, we were served two further duck dishes, made from the meat remaining on our bird after the breast meat had been carved, one of which would usually be included in the price if you order a duck. Of the four available duck “second serving” dishes, we had the spicy minced duck in a lettuce wrap; and the fried rice with diced duck . I just adored the lettuce wraps and the perfectly spiced duck, but the fried rice did not stand out for me as being particularly ducky – the predominant flavour was spring onion rather than duck and it seemed to be more of a side dish that needed a meaty accompaniment. Together with the duck dishes, a number of other main course dishes were also brought to the table and placed on the revolving lazy Susan in the centre of our table for us to help ourselves. There was the Alaskan black cod fillet roasted in Sha Cha sauce (£34) which I adored and was rather like the second cousin of Nobu’s famous black cod miso: flaky and moist fish coated in a sticky sweet and savoury umami-rich glaze. There was also the clay pot sanpei with corn-fed chicken (£16) – a hotpot dish packed with succulent chicken, vegetables and with a subtle heat from dried chillies. My favourite of the main course dishes was definitely the diced rib-eye of beef with black pepper sauce (£23) – a cascade of beef slivers and spring onions, all given some oomph by the generous amounts of black pepper in the mix. I also loved thecrispy noodle “cone” that the beef was served in! And just to make sure we did not get scurvy, we also had some wonderfully tender and flavoursome baby pak choi stir-fried in a garlic sauce (£9.50 for a generous helping). As none of us were particularly hungry by this stage, I was quite relieved to find that dessert was to be a fairly simple affair. We had black sesame paste dumplings coated in peanut crumbs (£6.20); and deep-fried Min Jiang Sichuan pancake filled with sweet red bean paste and served with Cornish vanilla ice cream (£7.70). The dumplings were my favourite, plump and yielding, reminding me faintly of Japanese mochi but set apart by the taste and texture of the rather addictive peanut crumbs. The pancake was crispy and not too sweet, and well paired with the creamy ice-cream. And of course, we could not leave without trying some Kweichow Moutai! Until I visited Min Jiang, I had never heard of or sampled Moutai, but this sorghum-based distilled spirit has been made in south-west China for centuries. It is served at official banquets for foreign heads of state and distinguished guests visiting China and is the only alcoholic beverage presented as an official gift by Chinese embassies in foreign countries and regions. When I saw on the label that the alcohol content is a hilarious 53% (bear in mind that tequila is only about 43%!) I expected to be drinking something akin to paint-stripper and steeled myself for a kick like a mule. But I can honestly say that the Moutai took me completely by surprise. It has a smoothness that belies its alcohol content and layer upon layer of complex flavours, from fruity to almost savoury and soy sauce-esque. It was a fantastic palate cleanser and left me feeling warm from the inside out – no wonder 200 tons of the stuff is sold annually worldwide! But be warned – it does not come cheap: a 50ml double tot will set you back £40. Service throughout was efficient and unobtrusive (and as I said, we were lucky enough to get some pointers on how to seat and serve guests at formal Chinese dinners, as well as pancake-folding lessons!) and the setting is sleek and modern while never distracting one too much from the million dollar view. I found the food to be excellent, and judging by the constant buzz in the restaurant throughout our visit, I am not alone in this opinion. I thought the price for some dishes was rather steep (the cod, for example, at £34) but then again a whole duck could feed four I suspect, and at £15 per head for the duck pancakes plus a second duck dish of your choice, that does not sound like a bad deal at all. If you do some digging, I am sure you could find comparable dishes at lower prices in some other more obscure corners of London, but for excellent and authentic Beijing duck with a a little glamour and a show-stopping view, Min Jiang is your place. For another perspective on the evening, have a look at Su-Lin’s post or Sarah’s post. Liked: the view, the soft-shell crab, the Beijing duck, the Moutai! In a nutshell: traditional Chinese food prepared with care and skill and a setting that’s the antithesis of Chinatown’s cheap ‘n cheerful restaurants – but be prepared to pay for it! DISCLAIMER: I enjoyed this meal as a guest of the Min Jiang and Sauce Communications but received no remuneration other than the meal. All opinions are my own. 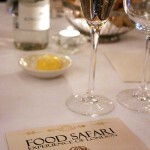 I will be teaching at an amazing 2 day Supperclub | Food Styling and Photography Workshop in London, together with the talented Meeta and Sumayya, on 15 & 16 February 2013. 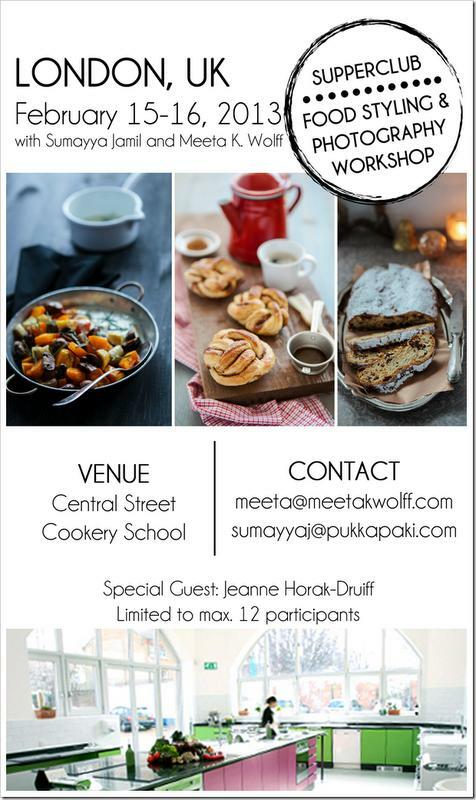 The workshop will include a hands-on food styling/photography workshop with Meeta, a session on overcoming the challenges of restaurant and low-light photography by ME(! ), as well as a culinary tour led by Sumayya where participants will learn different cooking techniques used in the Indian/Pakistani kitchen, create some mouth-watering dishes, and indulge in an array tantalizing South-Asian street food. Full details are available on Meeta’s blog and the workshop is nearly sold out, so do pop along and reserve your place now! OMG yes – the Royal China Club!! Ted wasn’t even talking yet then :o) Good times, good times… But yes, the food there was great and the post is still lurking in a dark corner of my drafts folder (eeek!). As an alternative (with a killer view!) I can’t recommend Min Jiang highly enough though. I used to go there with my mum – before it became Min Jiang. The Royal Garden was virtually opposite her office and I have very fond memories of both the space and the amazing view. I think the time has come to go back. What a great restaurant it’s become, by the sound of it. The duck was awesome – and dipping the glazed skin in sugar… so decadent! As an ex-pat Saffer/Brit who has been living in Beijing for three years I have become something of an afficionado of Beijing Duck – or ‘Kaoya’ – as it is called here. Sounds like you had a really good experience at Min Jiang. Two small points, the most honoured guest should have been served the duck head – that is fairly usual practice; also the price should include a big bowl of duck soup to serve everyone. The Chinese do not usually eat dessert after a meal, that is a very western habit. Meals end with a platter of sliced fresh fruits. The sweet dishes you had would be more likely to be served during the day or at noon as part of a dim sum meal. Dim sum is never eaten in the evening! As to the Moutai – it is just one of many brands of ‘baijiu’ , most are absolutely lethal, I think you were served a very very very expensive variety (at one banquet a year ago, my husband was given some 40 yr old baijiu to drink – which cost £3000 per bottle!) I wrote a blog post on baijiu and Moutai back in June 2011 – you might be interested.